The Grey Lady is changing. She’s becoming a modern woman, one who enjoys a 4.7-inch retina display more than her 28-inch desktop monitor. Over at The New York Times, staffers received an email letting them know the desktop site for The Times — you know, the site they all write for — would be blocked. To view www.nytimes.com, they’d have to do so via a smartphone or tablet. The “experiment” begins Monday, with the aim of making sure staff understand how crucial mobile is to the future of The Times. 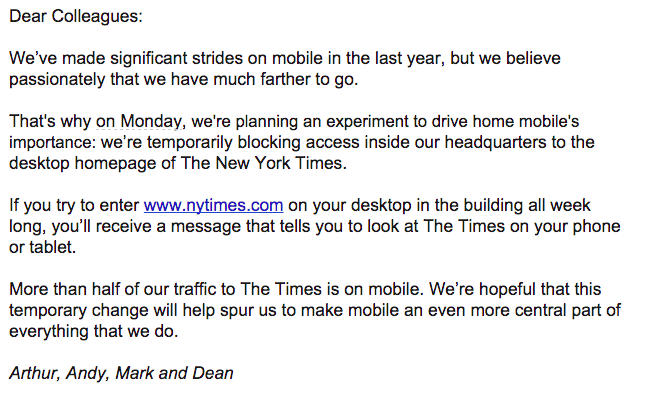 The emailed dictum also notes that “over half” of The Times’ traffic comes via mobile. A sign of the times (pun intended), no doubt. 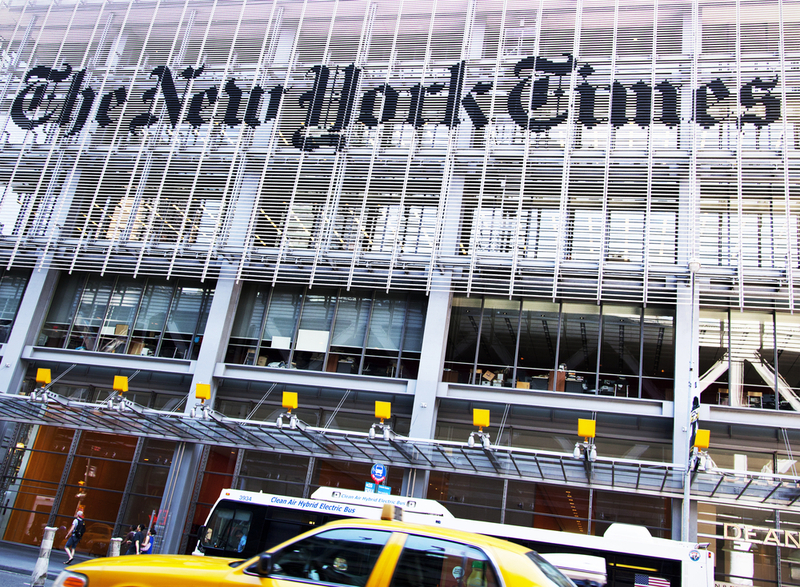 While most businesses encourage employees to leave the smartphone tucked neatly in a drawer or bag, The New York Times is asking that staffers use theirs exclusively to access content. In addition to underscoring the importance of mobile, a big push here is internal testing. More staff looking at the mobile site means more vested eyes paying attention. That likely means changes on how content from The Times is delivered and digested, too. What if an editor has a great new idea for mobile formatting, or someone in HR has a new font suggestion? Expect those ideas, which come from real users who happen to care deeply about how The Times performs, to carry weight. The New York Times isn’t encouraging staff to think about mobile, they’re forcing them to consume content via smartphones — and it’s brilliant. Smartphones aren’t a fad, they’re the most ubiquitous delivery device on the planet. A majority of The Times’ traffic already arrives via mobile, and that trend won’t reverse course. Ever.